We all worry about our skin. And many of us would do just about anything to make every inch and every pore look young and firm. Would you spend $150 for a small jar of beauty? It's a 1 0z. jar. Skin expert Nicholas Perricone hopes you will. The anti-aging guru has just launched Cold Plasma. Actually, the full title is Cold Plasma Dermal Matrix Regenerator. Wrinkles. Enlarged pores. Dryness. Redness. Discoloration. Uneven skin tone. Impurities. Loss of firmness. Loss of smoothness. And loss of radiance. That's a lot of promise in such a small jar of Cold Plasma, but, we will give Dr. Perricone the benefit here, because he develops some amazing and technologically-advanced beauty products. Sure, his beauty in a jar is never cheap, but then again, skin care is big business. So how do you use Cold Plasma? Very simple. Apply morning and evening on cleansed skin. Does it really work? Well, we have not tried it, but we did a little digging and found at QVC.com, that some women complained that Cold Plasma had an awful fishy odor. The product received 2 1/2 stars out of 5. 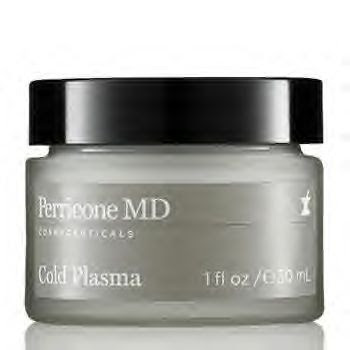 Or 35% of QVC customers would recommend Perricone's Cold Plasma to a friend. Ouch. We don't know how accurate those stats are, but the figures are printed there from customers on the QVC website. You can find Cold Plasma cheaper at Ebay.com in some cases. For more information, visit: http://www.perriconemd.com/.